Haiku is a short poem originated in the 16th century Japan. Traditional haiku is composed following a fixed format called yuukiteikei 有季定型. As a general rule, historical kana orthography, which is the old kana system, has to be used in haiku and the yuukiteikei is characterized by three features. Let’s have a look at these features through some examples below. Haiku is like drawing a picture by words to describe the scene that impresses you. It is a cultural and casual pleasure that allows people to get familiar with nature through the use of kigo 季語 (seasonal words). 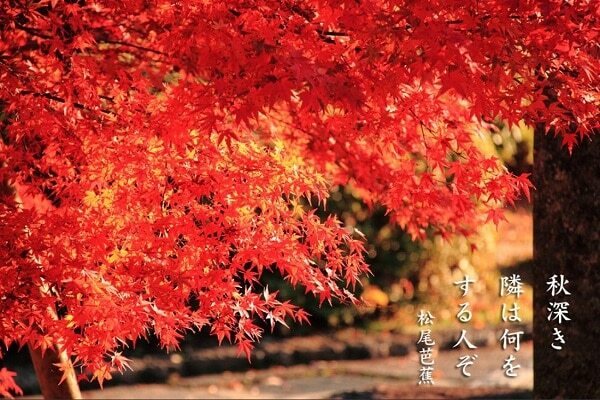 A haiku poem must contain kigo 季語 (seasonal words) or kikan 季感 (a sense of the season). In the example above, semi蝉 (a cicada) is the kigo 季語. Kikan 季感 is the most important element in haiku. You can include names of the seasons, such as haru 春 (spring), natsu 夏 (summer), aki 秋 (autumn) and fuyu 冬 (winter); names of the months, such as ichi-gatsu 一月 (January), ni-gatsu 二月 (February), and so on; or names of seasonal flowers, seasonal food, and seasonal features. Haiku has a format of san-ku juu-shichi-on 3句17音. That means it has a total of 17-on (17 syllables) and is composed of 5-7-5 (go-shichi-go) syllables. Each phrase is called ku 句 – the first phrase is called ik-ku 1句 (sho-ku 初句), the second ni-ku 2句, and the last san-ku 3句 (kek-ku 結句). Kireji is a punctuation word which has a function to complete the expression of the phrase in a limited amount of words. 「や ya」「かな kana」「けりkeri」are common kireji 切れ字 used in the middle of the phrase or the end of the phrase. The use of kireji brings extra meanings or special emotions of the poet so it is an essential technique in haiku composition. In English, it could be translated as “Ah!”, or the punctuation “!” or “-“. Below are some famous haiku by Japan’s most renowned haiku poets. Deep autumn – / My neighbor / How does he live, I wonder? Haiku has fascinated many people in the world and many famous haiku verses have been translated into English by famous writers. The translations have been done differently and it seems difficult to convey the minute nuance in English. It is both fun and challenging trying to apply what you have learned in Japanese language classes into haiku writing. There are many haiku competitions held regularly both in Japan and overseas. Submissions are usually available in Japanese or English, such as the International Kusamakura Haiku Competition, The Mainichi Haiku Contest, and the Ito En Oi Ocha Shinhaiku Contest.